This Cave House Was Built By A Cow. Seriously. 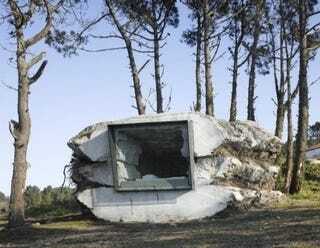 Antón García-Abril's Trufa house in Costa da Morte, Spain was built by pouring concrete over bales of hay and then letting Paulina - a hungry cow - carve out the living space. García-Abril of Ensamble Estudio built the Trufa (a.k.a "the truffle") by stacking bales of hay, dousing them in concrete, and burying them underground to give the building an organic, cave-like shape. Witness the process in fast-forward below. After the Trufa was cracked open, Paulina the cow ate the remaining hay buried inside, effectively carving out a living space over the course of a year, thus rendering her the most adorable architect on the planet. The final result? A gorgeous house, right out of Bedrock's newest luxury condo development.